In 2016, corporate boards will be looking at new challenges in managing increasingly diverse and complex risks. The list of issues for boards in the coming year is a daunting one, according to a blog by Institute of Directors Chief Executive Simon Arcus, published on NBR. It includes global economic challenges, the impact of the Trans-Pacific Partnership, international tax reform, changes to audit reporting, rapidly evolving technology, demands for corporate transparency and diversity, and managing stakeholder and shareholder relations. The number one board concern is long-term business sustainability, says Arcus. Seventy-three percent of boards in a Director Sentiment Survey now spend more time on risk oversight than a year ago. Forty-seven percent of directors think their industry will be affected by disruptive change in the next two years. The good news, writes Arcus, is that most boards—79 percent of them— are looking at the long-term sustainability of their business models. 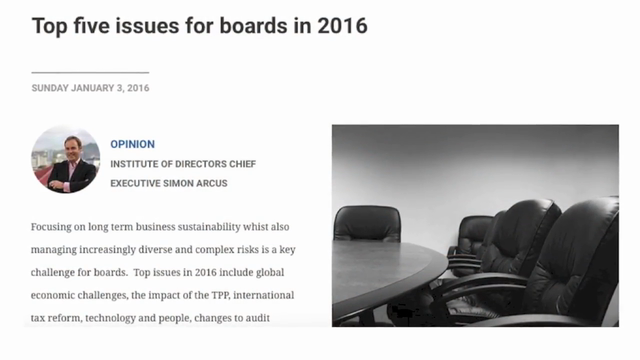 Go to nbr.co.nz to see the other four items on the “Top Five Issues for Boards in 2016” agenda. I’m John Howell for 3BL Media.